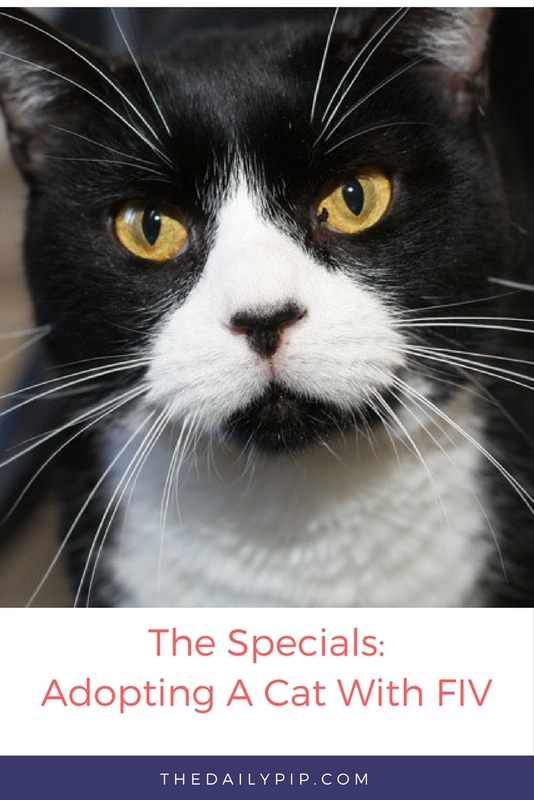 In celebration of Adopt-A-Cat Month, I have decided to take a slight detour and focus on Specials who are still LOOKING FOR HOMES. 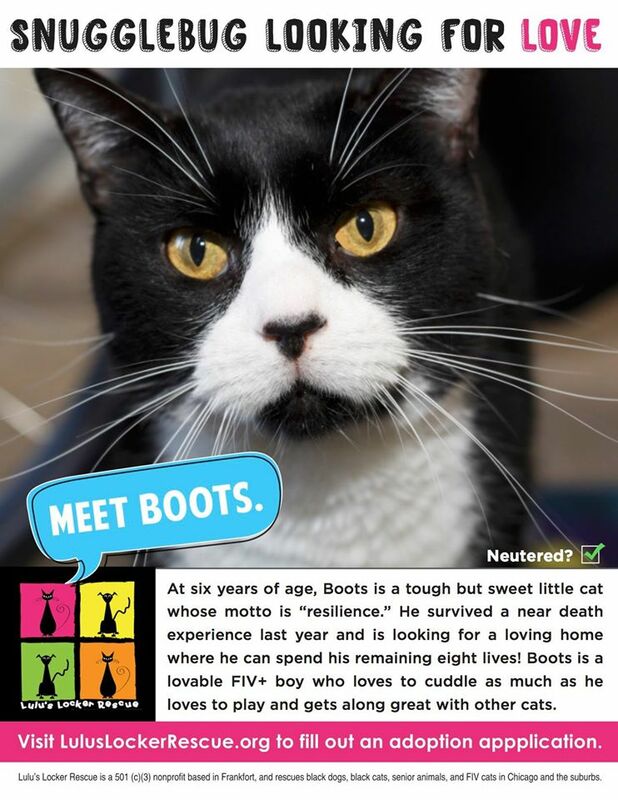 Meet Boots, a sweet, sensitive snuggle-bug who loves people and other cats. Boots was rescued from an open admission shelter by Lulu’s Locker Rescue in June 2014. Because of his easy-going, affectionate nature, Boots was adopted within months of joining the program. Sadly, he was returned in December 2015 due to a change in living situation and is now looking for his true forever home. 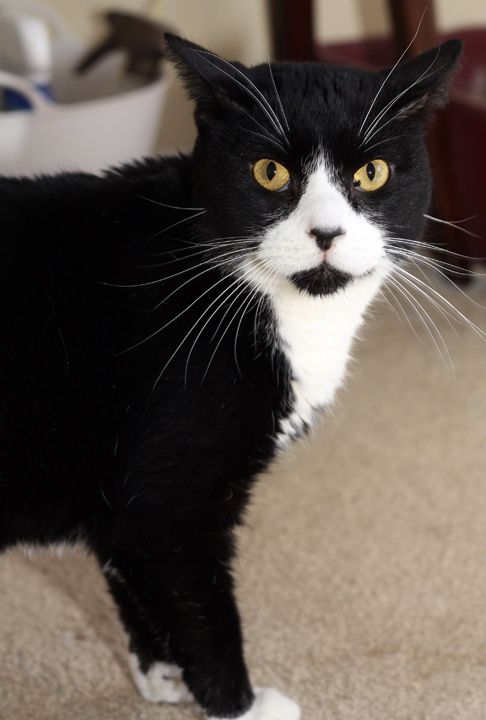 This handsome black and white, six-year-old, FIV positive boy is super sweet and would make a perfect companion for almost anyone looking for a loyal, loving feline friend. Unfortunately, many shelters (even no-kill shelters) euthanize or refuse to admit cats who test positive for Feline Immunodeficiency Virus despite growing evidence that they can live long, healthy lives and present no risk to cats, humans and other animals. Lulu’s Locker Rescue is a nonprofit, volunteer-run animal rescue working to change the misconceptions surrounding FIV cats as well as help black cats, dogs, and senior/hospice animals in shelters. Some animals, like some people, feel things more deeply and Boots is clearly one of these sensitive souls. When Boots was returned in December 2015, he was devastated. He stopped eating, hid constantly, and was more depressed and hurt than any other cat Lulu’s Co-Founder, Erin Lamparter, has ever known. His foster family did everything to comfort and help him heal emotionally and physically, but it was as if he had lost all hope and given up on life. Boots was hospitalized due to extremely high liver values. He was placed on antibiotics, force fed, and given fluids yet his condition continued to worsen. The attending veterinarian recommended he be humanely euthanized. Heartbroken, the rescue volunteers gathered to say their final good-bye. But miraculously, in what were to be his final moments, Boots gave tiny head butts and started to respond. They all agreed he deserved another chance. Each day volunteers sat with him while coaxing him to eat a few bites. Days turned into weeks, he gained weight and grew stronger. A month later his liver levels had stabilized to a normal level. Boots is now doing exceptionally well and has bounced back to his adorable, loving self. Clearly, this miracle cat has much to share, with many wonderful days ahead of him. All he needs is a patient, compassionate, committed adopter who will give him the second chance and forever home he so desperately deserves and needs. Boots would do well as an only cat or in a home with other easygoing felines. Please help Boots find his forever home by sharing his story widely! FIV cats should receive two wellness exams per year. A full blood panel and urinalysis is recommended annually. If your cat shows sign of illness or infection, visit your veterinarian as soon as possible – the quicker the infection is treated, the better. Always keep your cat indoors and as stress free as possible. For more information on FIV, please visit Lulu’s Locker Rescue’s education and resources page here. You can also follow this unique and amazing organization on Facebook. Please help Boots find his forever home by sharing his story widely! Such a great story. That poor cat. We sure hope that someone special can adopt him and great thanks to those peeps that helped him come back to life.. Boots we have all our paws crossed for you. Oh, how we wish we could adopt more cats! After I was diagnosed with asthma, I found out I was highly allergic to cats…so I had to leave my two cats with my ex and he was very good to them, but I missed them terribly. There are so very many cats and kittens that need homes!! Aww, what a sad story, but with hope! Boots sounds like such a sweet kitty and I hope he finds his forever home soon! Wow! Your blog has gone to the cats recently! Mine is too today. We have our paws full with our two adopted adult cats. My mom always adopts shelter cats and kittens when she wants a new feline. My gramma also has an adopted adult cat. So many kitties out there need homes with dogs. What an amazing story! Boots is a gorgeous kitty and most certainly deserves his forever home. Thanks so much for sharing. This is so wonderful, what you're doing with stories like this!Although I've never been fortunate enough to have one of my own, I have known numerous FIV cats, and they have all been some of the sweetest furbabies I've ever met. What's more, the FIV kitties I've known have always been healthy and happy, and you'd never know there was anything different about them. I am sending many purrs and prayers to Boots! He deserves his forever home, and anyone would be lucky to call this boy their own! Thank you for sharing about Boots! What a sweet boy <3 My Sassy girl is FIV+, so I am all about debunking all the misinformation out there about FIV! In the 3 years we've had her, she has never had to be taken to the vet for any reason other than her wellness checkups. She is healthy, happy, and has so much love to give – just like Boots, as I imagine. I will be sharing and hope that Boots finds that purrfect furever home! Prayers Boots finds his forever home ! Thank you for the information on FIV – I had heard of it but never really understood it. Eyeopening and I hope it helps other cats get adopted! Boots what an adorable cat you are. Thank you for your explanation of FIV. I hope that Boots finds that someone special to take him into their home. At only 6 years of age, he still has a lot of love to give. Thanks for sharing the information! I hope all of the kitties find their forever homes! I have a friend with two FIV cats. I love hearing her tell stories of the mischief these two get up to. I'm not familiar with FIV but I am quite familiar with special needs. I would not trade ANY of them for ANYTHING! I hope Boots finds his 'special' person very soon. Boots is so gorgeous! Simply a beautiful cat with a lot of love to give! Shame on them for taking him back! Kitties with FIV can, and do, live long happy lives! Boots is so handsome! I know FIV cats who've gone on to live normal, extended lives. It's definitely not the sentence it used to be. I love that my local shelters makes accommodations for FIV cats, and they adopt them out fairly regularly. I just shared Boots and hope he can find someone to love him who has room in their homes and heart for him forever. How wonderful that Boots has people in the shelter who didn't give up on him. I hope he finds a forever home soon. The White Dog Army hopes Boots finds the perfect family to give him a forever, rest of his life home. What is not generally recognized although researchers are beginning to look at the ability of pets and animals to process emotions, is that bonded pets can and do suffer depression of loss and often die simpy as a failure to thrive as a result. Poor Boots. I hope he finds his home soon. A rescue here has a separate FIV wing, I believe. I LOVE your series, as you know, and the NEW twist! I'm excited to share every one of your Specials Series posts and now it's to help a Special find a forever home…. PRICELESS!! Boots sure is handsome, I'll share him on Pinterest and hope he finds a forever home soon! Poor Boots. He's so lucky his volunteers cared so much about him. Mommy loves his little black nose. We shared him on Facebook. Such a cute kitty! I hope Boots is able to find a forever home soon! I hadn't known about FIV before. Thanks for helping to share information about this condition. So glad Boots responded in time. Such a handsome kitty.